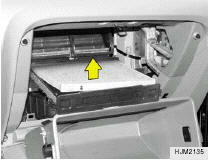 The climate control air filter is located in front of the evaporator unit behind the glove box. It helps to decrease the amount of pollutants entering the car. 1. 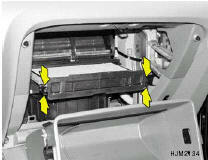 Open the glove box and remove the support strap through the hole. 2. 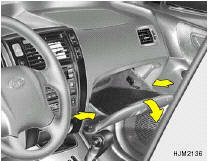 Lower the glove box down completely by pushing the both sides of the glove box inward. 3. Remove the climate control air filter cover by pressing both side's clips. 4. Remove the climate control air filter by lifting it. 5. Installation is the reverse order of disassembly. Be sure to install the air conditioner filter in the direction of the arrow sign. Otherwise, noise or filter damage may result.